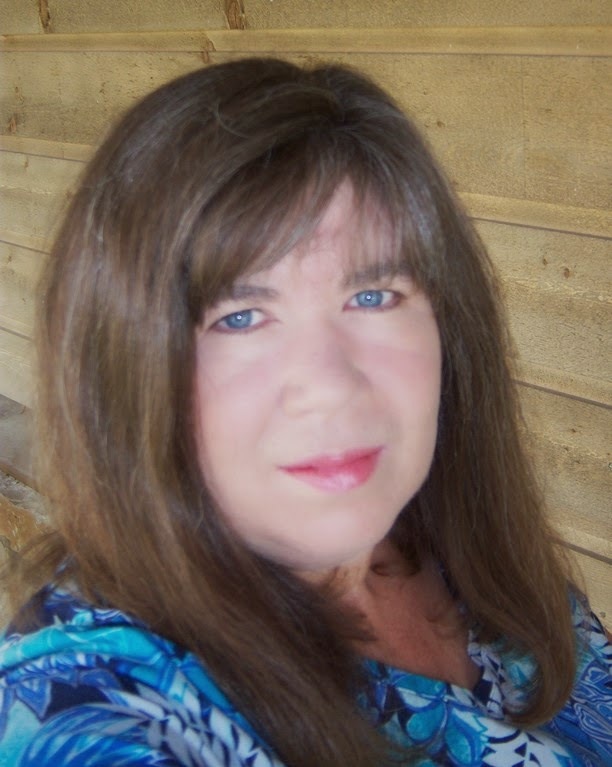 My “First Monday of the Month Blog” for Western Fictioneers was published today. Here it is. The irony of writing about the stresses and tensions brought on by the holidays — 1883 through 1887 — does not escape me. Last month’s blog, I tried to understand Christmas at that time. It was not my direct intention to follow that up with New Year’s at this blog, but, here I am. So, I realized I pretty much had the problem of trying to know how people celebrated New Year’s in the 1880s. It turned out to be a lot bigger problem that I expected. Like with Christmas, I found few direct references to New Year’s in the West. With two exceptions. There are no end of opportunities to celebrate New Year’s in the West today, but that doesn’t tell you much about how it was celebrated then. And New Year’s Resolutions (about more below) are dutifully recorded in diaries and journals all over the West. Without a doubt, the place to start is with champagne. The name has been around since the 1600s, although its protection as the sparkling wine from a certain region did not occur until 1891. Long before then, Dom Perignon added two features to the wine he pretty much invented, thicker glass and a rope snare to keep corks in place. The stage was set for shipping and a wine that began as a luxury with the Kings of France became industrially produced in the early 1800s and, yes, shipped to the West in the 1880s. While you did not have to be a King of France to buy it, you did have to find a way to make more money than you could working in the mines or poking cattle. It might be noted that a quarter of the population of the west was British born (or about two-thirds of the non-American born emigrants) and whisky remained the favored New Year’s Eve drink in the UK until the 1980s. It would not be much of a stretch to guess it was so in the West in the 1880s. It seems that before football games, there was another game: calling on ladies. In the 1880s, New Year’s day, rather than New Year’s eve, was the time for gala entertaining and Open Houses, usually held from noon until six p.m. Tradition held that all the ladies of a family, and all boys under the age of ten, stayed at home to receive callers while the gentlemen went out to pay visits. Newspapers would even print lists of the homes that would be open and the hours they were receiving visitors. The only requirement for admission was a calling card. “A general and cordial reception of gentlemen guests upon the first day of the year, by the ladies of almost every household, also by clergymen, and by gentlemen upon the first New-Year’s Day after marriage, was a Knickerbocker custom which prevailed in New York. It was once a day when all gentlemen offered congratulations to each of their lady acquaintances, and even employees of a gentleman were permitted to pay their respects, and to eat and drink with the ladies of the household. Hospitalities were then lavishly offered and as lavishly received. New Year’s Dinners–Raw oysters; mock turtle soup; boiled turkey with oyster sauce; roast haunch of venison; currant jelly; deviled crabs; potato souffle, baked turnips, stuffed cabbage, beets, lima beans, dried corn, and canned peas; biscuit, French rolls, rye and Indian bread; chicken salad, cold sliced ham; celery, cold slaw garnished with fried oysters, pickled walnuts, variety pickles; sweet pickled cucumbers, peaches, and plums, spiced currants and gooseberries canned pears or strawberries; English plum pudding; chess pie, potato pie, mince pie; orange souffle, pyramid pound cake, black cake, Phil Sheridan cake; Bohemian cream; oranges, raisins, figs, nuts; tea, coffee, chocolate. New Year’s Table–When receiving calls on New Years’ Day, the table should be handsomely arranged and decorated, and provided with rather substantial dishes, such as would suit the taste of gentlemen. Too great profusion, especially of cakes, confectionery, and ices, is out of taste. Selections may be made from the following: Escalloped oysters; cold tongue, turkey, chicken, and ham, pressed meats, boned turkey, jellied chicken; salads, cold slaw garnished with fried oysters; bottled pickles, French or Spanish pickles; jellies; charlotte-russe, ice-creams, ices; two large handsome cakes for decoration of table, and one or two baskets of minced cake, fruit, layer, and sponge cake predominating; fruits; nuts; coffee, chocolate with whipped cream, lemonade. I also note that oysters made an appearance at a gathering of early Dakota Territory settlers on New Year’s Day in 1880. Not merely traced back to Ancient Greeks and Romans, American Indians on both coasts considered them a staple in their diet. Abraham Lincoln also served them to guests at parties at his Illinois home. The mention of Chinese New Year’s occurs frequently and one notable reference even identified that the 1880 census listed more than 100 Chinese in Evanston. …. The Chinese staged lavish New Year’s celebrations at the end of winter on the traditional Chinese calendar, including a dragon parade through downtown and fireworks. Perhaps the greatest way to bring in the new year occurred on New Year’s Eve of 1879. Edison gave a public demonstration of his new light bulb, lighting up his laboratory and a half mile of streets in Menlo Park before of thousands of spectators. By 1881, Edison’s Pearl Street station in New York was supplying about 400 outlets for eighty-five customers. Cities in the West first became lit with electricity in the 1880s. It is said the ancient Babylonians were the first, but the Romans took it up and then the Christians. In fact, the first day of the new year became the traditional occasion for thinking about one’s past mistakes and resolving to do and be better in the future. It turns out all over the West, people made resolutions. They not only made them, they wrote them down in their journals and diaries. Mostly, they resolved to make a better life for themselves and their families. They not only resolved, they made better lives for themselves and their families — Us. Happy and Prolific New Year to All Western Fictioneers. E-mail Edward Massey with comments, author of 2014 Gold Quill winner, Every Soul Is Free and Amazon ABNA 2009 Quarter-finalist, Telluride Promise. I wrote about amnesties and pardons because my sheriff was concerned the governor would use his annual Christmas amnesty to pardon a murderer who faced the firing squad. Fugitive Sheriff lived through four years of Christmas. What was Christmas like in the West in the 1880s? Whatever it was like, if anyone at the time wrote about it, their words have proved more elusive than my googling skills have retrieved. I found a lot of interesting stuff, including a remarkable number of places and persons named Christmas, but what follows is a triangulation, a guess at what might have and must have been the celebrations of Christmas, using the 1880s as the ending point for traditions by then begun and now taken for granted. Right off the bat, I discovered a controversy I did not know existed. “’Twas the Night Before Christmas” was believed until 2000 (and until last week by me) to have been written in 1822 by Clement Clarke Moore for his two daughters and later published anonymously in Troy, New York on December 23, 1823. 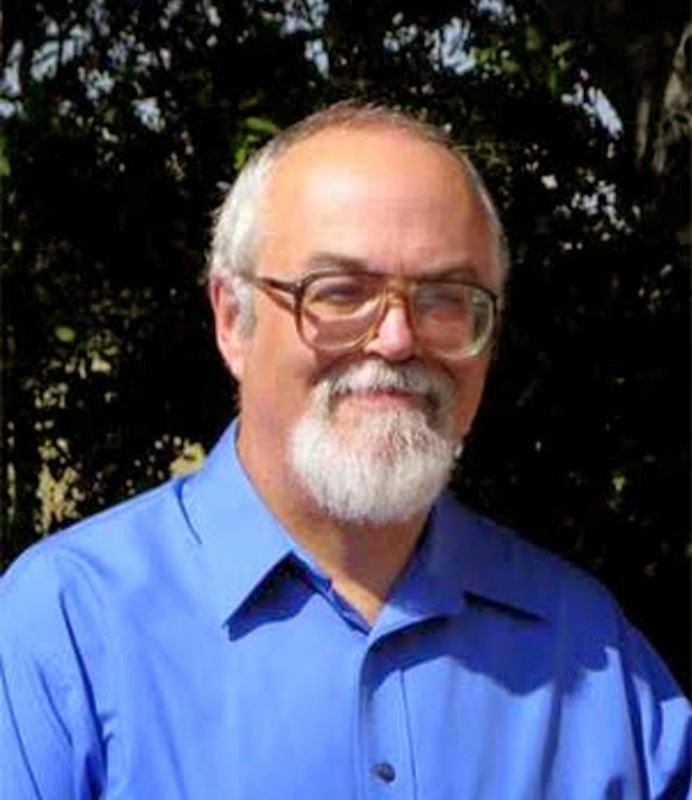 In 2000, Don Foster published a book, Author Unknown: On the Trail of Anonymous, in which he demonstrated that Moore could not have been the author and concluded it must have been written by Major Henry Livingston, Jr.
Now on to tastier, though no less spicy, fare. Like most of our Christmas traditions, mince pies came to us from the UK, dating back to Stuart times. They were a status symbol. Having pies meant you were rich. You could afford both meat and the best and most expensive pastry cooks. With their main purpose to show off, they were originally made in various shapes like stars, crescents, hearts, and flowers, the most intricate constructed like jigsaw puzzles to fit together. Some sources report they were filled with meat, such as lamb, rather than the dried fruit mix of today. Both notions are anathema to me. Our Western forebears never filled a mince pie with lamb when venison was available. For damn sure, mine went out and shot their deer and brought it back for the making of the mincemeat. And I am certain of that still today. My wife makes mincemeat and she calls up her brother and he goes out and gets a deer and ships the venison to us. Her preference is neck meat, but any will do. 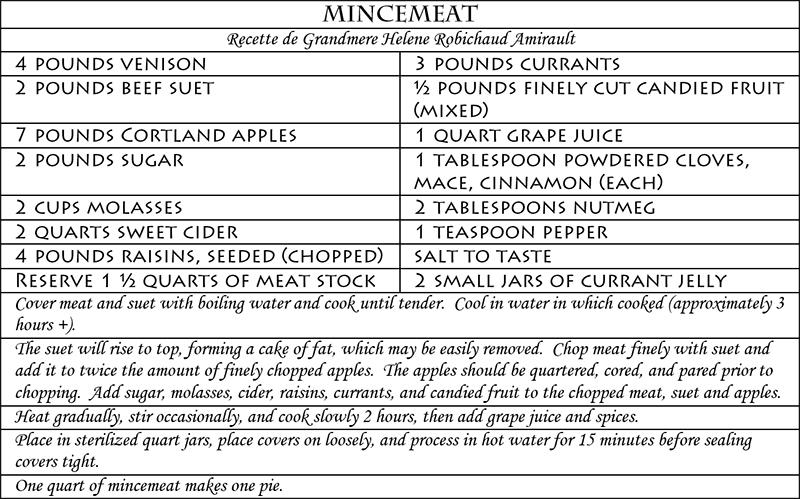 Anne and her brother aren’t Westerners, they’re Mainers, of French descent, but I can personally vouch for the authenticity and richness of her mincemeat. So much so, that I share with you her recipe. Though eating mince pie was a Christmas Eve tradition, I doubt anyone in the West of our interest asked why Christmas Day was celebrated on December 25. The first record of Christmas celebrated on December 25th was in 336AD, during the time of the Roman Emperor Constantine (the first Christian Roman Emperor). Bringing his Christian army to conquer the Goths, he discovered a pagan rite at the beginning of Winter and took it for his own. He told the Goths they were celebrating Christmas, thereby conquering the Goths with spirit and spirits. Second only to the English, emigrants to the West were German. A second tradition starts with the day Mary was told she would have a very special baby (the Annunciation), on March 25th. Nine months after the 25th March is the 25th December! How many Western settlers celebrated the Annunciation showed up on no record I could find. Finally, among early westerners were a smattering of wandering Jews. Hanukkah, starts on the 25th of Kislev, the month in the Jewish calendar that occurs about the same time as December. Hanukkah celebrates when the Jews were able to re-dedicate and worship in their Temple, in Jerusalem, following many years of not being allowed to practice their religion. There is ample evidence of Temples being dedicated in the West in the 1880s. Not being Catholic, I did not know that the ‘Christ-Mass’ service was the only one that was allowed to take place after sunset (and before sunrise the next day). People had it at midnight! Northern Europe gets credit for this with documented evidence of the first Christmas tree in Riga, the capital of Latvia, in 1510 and the emergence of Yule logs in Scandinavia soon after. Martin Luther was the first to take the Christmas tree into his home, in the 16th century. 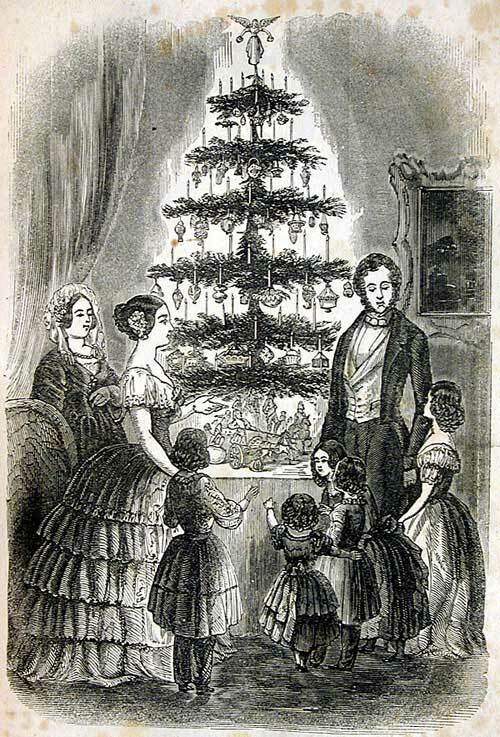 The Christmas tree basically came to America via Britain when the drawing of “The Queen’s Christmas tree at Windsor Castle” (set up by Prince Albert, Queen Victoria’s German husband,) was republished in Godey’s Lady’s Book, Philadelphia in December 1850 (without the Queen’s crown and Prince Albert’s moustache to make it look ‘American’!). Christmas trees were prevalent in our west – and not too difficult (well, except for the work involved) to go out and cut down an evergreen. The idea took off in Europe but lagged in America, until the Civil War was over – and Christmas was declared a holiday in 1870. 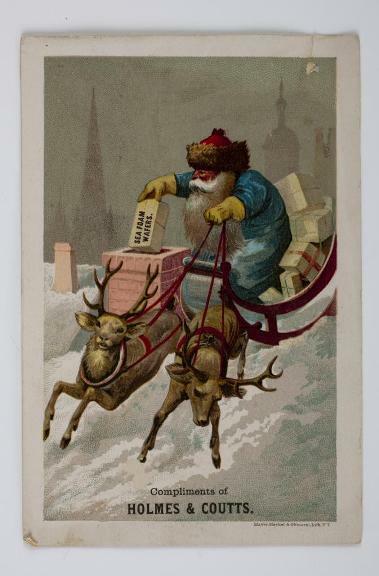 The transcontinental railroad completed in 1869 made faster mail service possible and the ground breaking printing capabilities of printer Louis Prang transformed the postcard-size European Christmas card to gifts of art sent through the mail. Prang learned the art of chromolithography, a technology that allowed him to make duplicates of fine art to bring fine art to the masses inexpensively. In 1873 in Vienna he was presented with the idea of making an artful Christmas card. He liked the idea and by Christmas 1874 Prang’s designs started to catch on – not as Christmas cards, but as art. Costing as much as 25 dollars, the Prang holiday designs were sent by many as gifts. Unique to Prang’s Christmas art was new verse written by well-known poets of the time, such as Henry Wadsworth Longfellow. During the 1880s Prang’s factories put out more than 5 million Christmas cards a year and were noted for offering stable, suitable employment especially for women, a real rarity of the times. By the 1890s, cheap knock-offs were imported and Prang’s popularity began to diminish, but the Christmas card was established. Alabama was the first state to grant legal recognition to Christmas in 1836. By 1890 all states and territories had done so, including DC in 1870. Christmas is the only annual religious holiday to receive official religious and secular sanction. The following list of Western states and the year they recognized Christmas is taken from Having a Wonderful Christmas Time Film Guide by Terry Rowan. By end of 1887: California, 1851; Colorado, Nevada, 1861; Oregon, 1862; Idaho, North Dakota, 1863; Montana, 1865; Kansas,1868; New Mexico, 1876; South Dakota, 1877; Texas,1879; Arizona, 1881; Utah, 1882; Wyoming, 1886. Carols were first sung in Europe thousands of years ago — pagan songs, sung at the winter solstice as people danced round stone circles. (The word carol originally meant to dance to something.) So, what did today’s most famous source of Christmas carols do in the 1880s? Named after the Salt Lake Tabernacle, the Mormon Tabernacle Choir is credited with being founded in 1847, although the Tabernacle was not completed until 1867, the first recorded choir conductor was not appointed until in 1869, and the choir held its first concert at the Tabernacle on July 4, 1873. I could not find any documented Christmas pageants during the 1880s. We all know they existed by the time of the first-ever recording on September 1, 1910. Given the tradition of music and theater, my bet is the Tabernacle Choir was performing, I simply could not find the evidence. Last year, to encourage reading, support bookstores, and buy books, I offered to send a second book for one dollar. This year, I expected to have another book to offer you. Alas, Fugitive Sheriff has not yet surmounted all his trials and tribulations, but still Christmas and Holidays roll around. 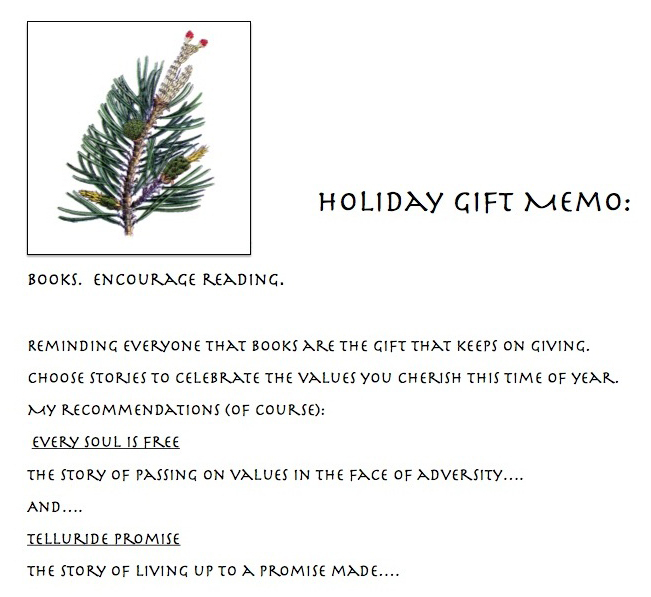 And again, I encourage you to give the gift of books. (My books, to be sure.) So this year, the price of a signed and mailed book goes down – and a second book still costs one dollar. Go to Amazon.com for twenty-three terrific reviews and, of course, if you prefer, buy the books on Kindle. So far, five have written back. If the others come in later, I will post them next month. I always write a letter to my readers in every book and give them my email. If you write me or email me you get a list of my books in return and a copy of our magazine www.saddlebagdispatches.com. … I try to get the book reviewed. I write blurbs for other authors to get my name out there. A western reader reads my blurb he may go look for my books. That is better than all the e business you can get into. I answer interviews like this to get my name out there. …. I have a column in a tri-state farm magazine–no get rich deal but it brings me readers. I have column in StoryTeller magazine. She shows my books on back cover in trade. I have book signings at events, library, shows. In the right place I make several sales and new fans. My first e-book/printed was with a small publisher. It had been out for five years. He gave it away one weekend . … We handed out 10,000 copies. Neither of us could not believe it. I had never gotten a 10 whatever for the IRS in income on it. In the next 18 months the total sales reached what a good New York book publisher paid out for a western. I plan to try that again on another project in the future. 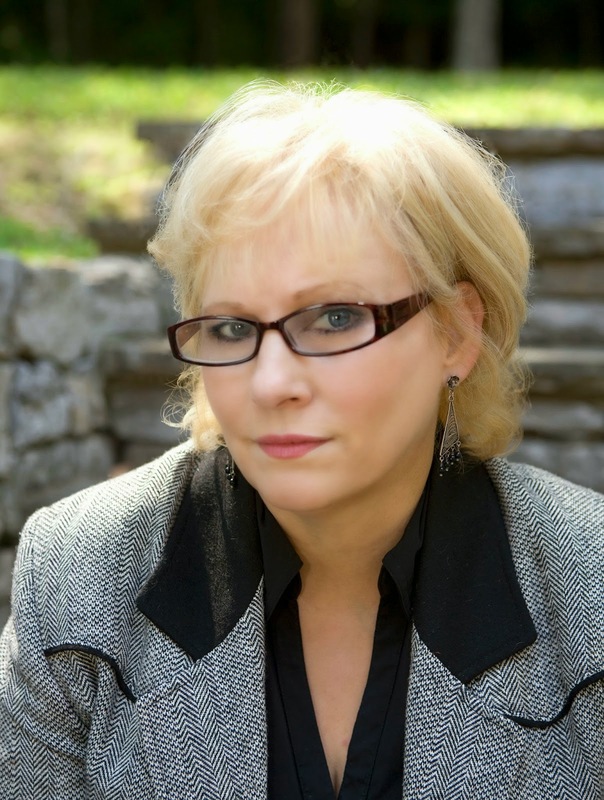 Maybe the most important thing a writer can do today to sell books–whether they’re traditionally published, self-published, or come from a small press–is to maintain an active presence on social media. That can be overwhelming and too time-consuming, so it’s probably best to limit those activities to a few of the available platforms. I use my blog, Facebook, and Twitter for the most part, but a writer should do whatever feels comfortable. Just get your name and info about the books out there! Other than writing good books to start with (always the first step), I think the key to selling is to keep writing. Each book’s sales builds on the last, and when you have enough work out there it’s easier to run special sales and promotions with the earlier titles. So when you finish a book, it’s fine to pat yourself on the back–but then start thinking about the next one! When you submit your work, be sure you have had it professionally edited AT LEAST for grammar, tense agreement, and punctuation. Most editors have at least three different price lists, dependent upon how much editing is required or asked for. This would be the cheapest for some–mid-level for others on their pricing. When you send your work to a publisher with poor grammar or punctuation, the publisher sees that you really don’t know what you’re doing–or care. If you don’t care about your own work, why should a publisher, or a reader? One final note on Sowing. I told you about Writer’s Relief. Well, I subscribed. True to their word 29 my initial queries are out doing their work for me. Well, 25 are still at work, I have already received four “unfortunately, this one doesn’t sound like it’s right for us.” I was pleased with their efficiency and helpfulness in the first cycle, so I am risking a second. I’ll keep you posted. or buy Telluride Promise here. The best marketing plan is to write. In my January blog I mentioned Hugh Howey because he makes this point far better than I, both on his website and in his podcast with James Altucher. It is no more profound than the observation that successful novelists we remember have all written many books, save Harper Lee and one or two others. Four to four hundred novels seems to be the range needed for success. Some Western Fictioneers can publish thirty books in three years, some can publish one. Not to despair, one book in three years means four in twelve and there you are, on the power curve. So, write two, three, four hours a day but even then you may need some ploughing in other fields. The article devoted a lot of space to celebrities, Hollywood film deals and best seller lists, before it returned to some realistic observations. Moulton suggested we test the idea at the Wednesday roundtable breakfast, if I was willing. Absolutely. I asked her for permission to mention the Roundtable breakfast in this blog. Absolutely. She reminded me to mention that the convention is open to non-members of WWA as well as members and that registration materials are available on the website, www.westernwriters.org. 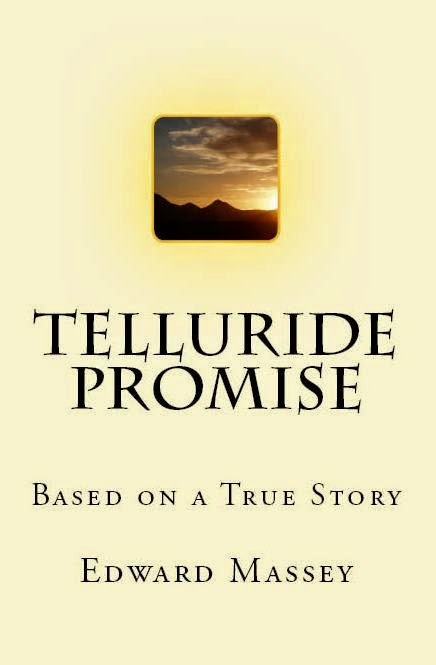 The idea started with my first novel, Telluride Promise. A venture capital colleague, who specializes in proprietary schools, suggested that it should be a format for teaching ethics in business schools. A subject much needed, hard to achieve. With Every Soul Is Free, 100 hundred years of strong values, powerful and interrupted lessons between grandfather and grandson, and the conflict of choosing calling over family have led to discussions with a major private bank, an investment bank, a foundation, and a well known product based corporation on subjects of trust, career, and generational values. Not to get ahead of myself, these are long sales’ cycles and major success still lies in the future. The concept is, so far, well-received and I am certain that fiction has a major role to play in the value systems of corporations. A breakfast, lunch, dinner, or evening reception allows the company to communicate a set of principles it holds dear to its stakeholders, without ever directly “selling” the company. No one needs to have read the book. Selected readings illustrate the principles and the discussion is on. There are many topics supported by Western literature. The point of the roundtable breakfast is to encourage every author to think of how their Western novel demonstrates standards and values that businesses want to instill in their personnel or communicate to their clients. With tables for 10 people, the point of this blog is to invite 9 writers to the breakfast. Come as a presenter and bring your book and one idea. State the theme. Read up to 3 sentences and launch the discussion. We’ll work for three minutes to talk about the principles involved and thoughts on how to market your novel to businesses. No prior success is necessary, this is exploratory. If you have no presentation to make, as I said, this is exploratory, please come and explore with us. With luck, we’ll digest breakfast and a few insights and views about what principles work and how to sell them. If you’d like to post suggestions for topics in the comments below, or e-mail me, please do and maybe we can get a full agenda on hand before the 24th. I am still looking to this blog to force me to work on my bio. I have not yet made it past the starting point. 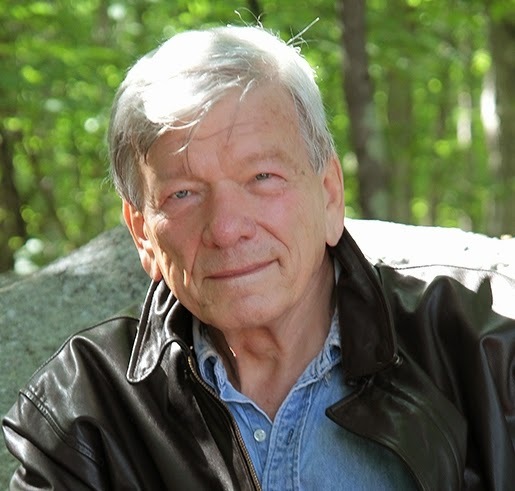 Telluride Promise gained the quarterfinals in the 2010 Amazon Breakthrough Novel Awards. 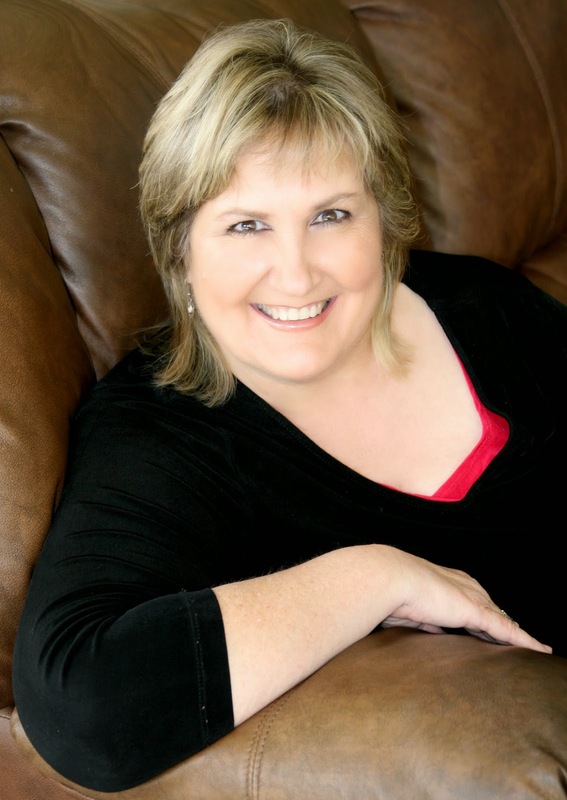 Every Soul Is Free won the Gold Quill, Grand Prize for best novel published in 2014, from the League of Utah Writers. Edward’s third novel is finished. He is at work on his fourth. 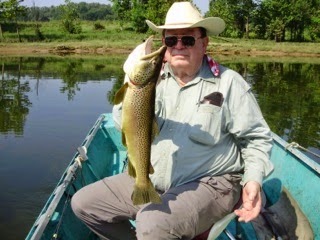 He and Anne live in Stamford, CT and look forward to a visit from any Western Fictioneers! 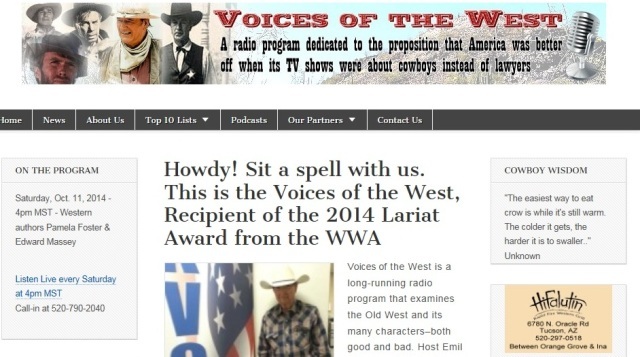 I was asked to provide a blog to Western Fictioneers the first Monday of every month during 2015. Since I had never hit that regularity with my own blog and since I wanted to be a good WF member, I committed. It took until last Tuesday — yes, after three-months notice, but six days to do the work — before I knew my topic. Obviously, my biggest challenge should be my topic. What I wrote is shown below. The blog had some graphics from this website, so I do not repeat them here, but if you want to take a look here. In preparation to take up the first Monday of every month blog, I read prior WF blogs. I have read every December blog and I have set the year-long intention to read all 257 blogs from 2014 and the current ones. December blogs averaged 879 words. Two-years worth will amount to some 520,000 words, 5 or 6 Western Fictioneers’ novels! A massive array of topics and approaches led to the question: what am I going to take up on my first Monday? To zip through the reasoning process, I am going to take up an Odyssey – my quest to market my books and build a brand. I am not all that sure I want to become a marketeer, I already have as much as I can handle in trying to become a good writer of novels. At the moment, between Scylla and Charybdis seems to be my only choice. I count it lucky that the blog is the first Monday of every month. One of the principles to establish for myself and this blog is to use the first Monday of very month to review what we will do this month and this year to market our work and promote our brand. “Do” for our purposes means: create the marketing plan, implement the marketing plan, and reap the results. I invite you to watch over my shoulder, share your ideas and suggestions, and participate all along the way. As Tom Rizzo said in one of his blogs, consider this a participatory blog. In the Comments section below, leave your questions, recommendations, stories, and tips. Create the Marketing Plan. It could be that a few may read this blog who have the same problem. I have no idea how many writers, particularly Western Fictioneers writers, know how to market the work, sell the books, and write the next one, keeping all tasks miraculously in balance. Probably many of you are out there. I have met at least one of you – well, one pair of you: Kat and L.J. Martin. Anyway, a year has passed since I responded to Cheryl’s request for a Friday Five. I had no idea, then, how much would happen in the year. About that time, I had a manuscript out to two publishers – eerily similar to my current situation. A month later, Pen-L Publishing committed to publish Every Soul Is Free. Duke and Kimberly Pennell fulfilled their promise to get it published in time for my 50th Reunion last May. I created an ambitious marketing plan that touched all the bases. Caveat before we go any further: It is more likely that I will be learning from you than vice versa. Along the way, I will try hard to pass along information that I have found helpful (like James Altucher’s podcast with Hugh Howey). My suspicion is that the most helpful information I will turn up will help authors who self-publish, publish with print-on-demand publishers or independent publishers. Since I despair at the prospect, I doubt anything I turn up will help my readers crack the agented and New York publishing house market. As Charlie Steel so adroitly observed of us as a group, I am one of “us [who] are old.” You might have guessed that with the 50th Reunion reference. For the most part of my life, I did business things. Now that I am in the business of writing I am not at all opposed to author effort. In fact, I welcome it. What I find impossible is coming up with the marketing ideas, channel pursuits, and implementation as well as writing and doing the author effort. I realize that I have been given handbooks and suggestions that, somehow, did not take. After three months, I realized I could not do it myself. So, I tried my hand at hiring somebody who would do all the tasks and set up the opportunities for me to come in and make the sale, read the book, give the talk, or sing and dance, whatever it took. They couldn’t do it either. This list is in this format because I could not manage the WF blog software, but it is here, at all, because it is the whole list of my marketing results. That four hours of joyous writing did result in completing my third novel and I am very happy with it. 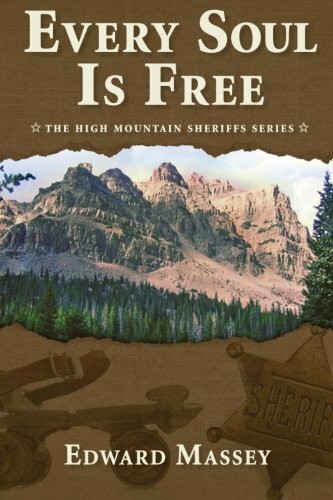 It is not a Western; it would not qualify under the Peacemaker or the Spur Award rules, but it is set in the west and it deals with what I think the west is all about – a man’s values and how he balances career with commitment to family and community. A publisher has shown an interest. The way he expressed his interest was to tell me to submit the full manuscript along with my marketing plan. So, this blog has some real-life meaning. What Charlie Steel further pointed out is how prolific some WF authors are with 60 to 600 books and a few 35s and even some 10s and 20s thrown in. I think the clear conclusion from Hugh Howey to Charlie Steel is that if you have to choose between marketing and writing. Write! So, although the goal of this year’s blog will be to lay out the program and focus on how to make it happen, the fallback position will always be – end the torture and write! One learning I have already achieved (by reading all the WF blogs) is that the reason for doing a blog is to get to the end where you make a pitch for your books and your brand. Every single one of them did it. I am cheered. One of the tasks this blog will force is work on my bio. Here is the starting point: Edward has published a novel, Telluride Promise, five short stories, and Every Soul Is Free. 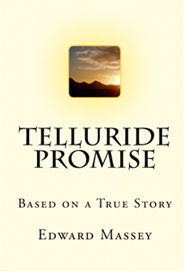 Telluride Promise gained the quarterfinals in the 2010 Amazon Breakthrough Novel Awards. The League of Utah Writers named Every Soul Is Free the Grand Prize winner for best novel published in 2014, awarding Edward the Gold Quill. His third novel is finished and he is at work on his fourth. All social media accounts set up but not really working. Implementing them will be part of this blog. Go to Amazon.com for twenty-one terrific reviews and, of course, if you prefer, buy both books on Kindle for even less than my one dollar special. Happy, healthy reading in 2015. John Dumas published his podcast interview with Edward today, December 1. He has a terrific podcast. This worked very well. Also see John’s website, Entrepreneur on Fire. You will find a very professional and thorough website, a mirror image, by the way, to the preparation and process for his podcast interview. While we’re on the subject of entrepreneurs, John is a 34 year-old Mainer who has relocated to San Diego and ignited with this podcast. Talk about “On Fire,” the show achieved Best of iTunes in 2013 with 7.4 million downloads. Speaking of iTunes, this podcast is now permanently available here. Go to Amazon.com for twenty terrific reviews and, of course, if you prefer, buy the book on Kindle.